I did eventually get caught up in all of the action, with one minor hitch. There’s a little suspense surrounding the mysterious and rumored existence of Dark Gifts, which are mentioned briefly a few times before becoming an integral part of the story more than halfway through the book. After a Topside doctor publishes reports concerning the health and development of one of the first children born under water, people begin to fear living underwater will turn them into mutants. Dark Gifts are new abilities special to underwater inhabitants. The fact that these abilities can develop whether a pioneer is born underwater or not has Topsiders anxious. It also makes dealing with Gemma difficult. As a Topsider, she has as many preconceived notions of what life must be like for the pioneers; everything is new to her and she gawks appropriately. Ty, who’s quite used to and fed up with being poked, prodded, and stared at for his skin’s unique shimmer--a physical byproduct of his underwater diet--has a short fuse when it comes to Gemma’s curiosity over how shimmery he looks. He’s self-conscious and discreet, she’s loud and obvious; the two make quite the adorable, humorous pair. While this awkwardness made for a great relationship between Gemma and Ty, Gemma’s sporadic curiosity over Dark Gifts, especially when connected to Ty, fell short of keeping my interest sustained when the issue finally became important. Her interest, at best, was negligible. It made the narrative a little awkward when suddenly the reader finds out they’ve been dealing with an untrustworthy narrator this entire time, just for the sake of surprise. The text doesn’t directly support the revelation that comes near the end, but it does hint very vaguely in that direction. I wish it would have been something the reader could have worked out on their own--not that Ty has a Dark Gift, which is pretty obvious, but what exactly his gift is. For all of my concerns, there were things I did enjoy about Dark Life! The world building was fascinating and filled with little things to help shape Ty’s surroundings: aquatic descriptions and expletives (these were cute), maritime phrases and technology; the Pioneers of Benthic Territory have adapted very well to their new circumstances, albeit with a shortage of females. I especially liked the comparisons between Ty’s home and Gemma’s living quarters as a ward of the Commonwealth. Since space has become such a hot commodity, she marvels at the luxury a home with multiple rooms represents, especially since she shares a single room with another ward. I was pretty amused when one of Ty’s neighbors gamely (and persistently) offers Gemma any room in his home, if she’s willing to marry him--a man old enough, I would imagine, to be her father. The secondary characters were quite charming; Kat Falls has a sense of humor that’s hard to miss--I only wish I could do it more justice in this review. I was intrigued by the New Puritans, a religious sect that’s built on the doctrine that global warming is punishment for humanity’s sins. They weren’t, however, too consequential and were easy to forget since they were part of the narrative only in passing. I thought there would be some kind of conflict where the New Puritans got involved, making things difficult for Ty and the pioneers by adding to the list of antagonists Benthic Territory kept racking up (Falls is good at making bad guys), but it wasn’t so. 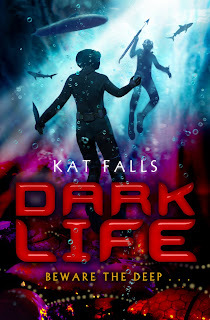 I can’t say I loved it, but think if you’re looking for an exciting, funny read with creepy bad guys and a twist ending, Dark Life may be the book for you! I've been wanting to read this one...great review!